Lama Zopa Rinpoche in Chenrezig Institute gompa, Eudlo, Australia, June 2018. Photo by Ven. Lobsang Sherab. 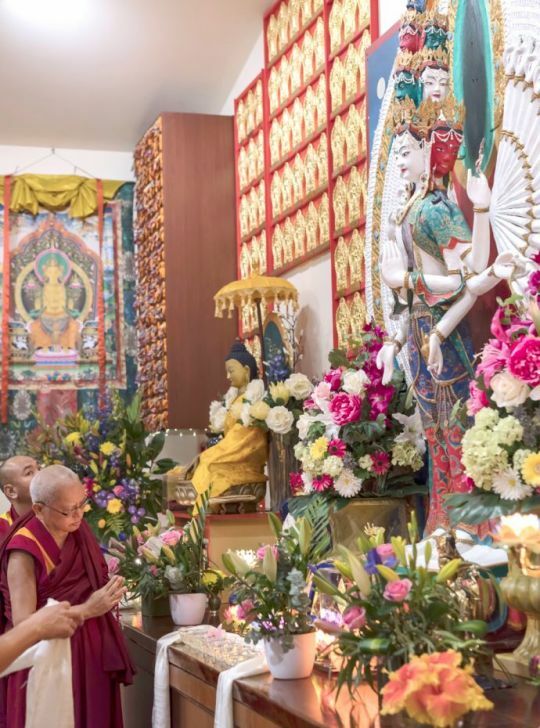 During a teaching at Chenrezig Institute in June 2018, Lama Zopa Rinpoche discussed how we don’t know when our time of death will arrive. So death can happen any time. You never know. At Kopan when we were together—Lama Yeshe and Losang Nyima, Lama’s disciple from Tibet, the attendant from Buxa, and then Zina Rachevsky, the first Russian student—when we were together, I was thinking, “Who will die first?” I didn’t say anything, but I was thinking, “Who will die first?” I was thinking it as we were sitting around. Even the Buddha wasn’t in the same aspect. He showed impermanence with the holy body. Lama Yeshe passed away, a long time ago. Now you see only the bones, Lama’s relics. Losang Nyima is dead. Zina is dead. Lama Lhundrup—who was an excellent disciple of Lama Yeshe from Tibet, had excellent Dharma knowledge of philosophy, debate and all that, who was totally devoted to Lama, devoted to whatever Lama said, and had a stable mind, devotion—he passed away. Lama Pasang, who helped to build houses, bring food, and all that, also dead. So many already left the monastery. Just from that you can understand. So at the moment we are in the process—I don’t know whether it is good or bad that we didn’t die yet. We are in the process, in the same process of dying. Every day we are in the same process. Colophon: Excerpted from Lama Zopa Rinpoche’s teachings at Chenrezig Institute, Australia, June 2, 2018. Simultaneously transcribed by Ven. Joan Nicell. Edited by Claire Isitt and Laura Miller, August 2018. Whatever problem one experiences if one thinks about the benefits of problems and how they are beneficial for ones own life, to develop ones mind in compassion, to develop loving kindness, patience, wisdom, and all the positive qualities for the path to liberation. By thinking of the benefits one develops this precious quality, this most healthy positive way of thinking that brings happiness and that stops you from harming yourself and stops you from harming others.